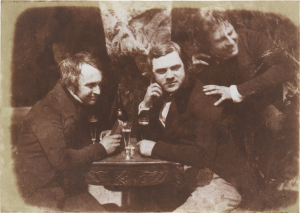 This image, a remarkable capture from 1844, shows three Scots drinking ale. The beer was undoubtedly rich Scotch ale, probably around wine strength, hence the small Champagne flute glasses. These glasses were traditional for strong ales in Scotland and England until about 1900, when this style of beer finally fell out. The gent on the right probably had been seated in front of the centre glass, since the other men hover over their own glass. He was (see footnote below) apparently the painter and photographer, David Hill, and either joined his comrades for the exposure (lengthy at the time) and/or had his partner Adamson take the image. These were the beer fraternity, it can be 1844, 1900, 1960, 2015, 1600. Some things don’t change. *Image in public domain, see here for source which gives fascinating detail on the photographer and persons shown. Well, how about that? I like drinking strong ale in a fluted glass. I’m in the wrong century.